Today we received a phone call from a German News agency asking us to film the Eastbourne pier fire. As we are based in Seaford which is 9 miles from the Eastbourne Pier fire we had to get a move on. 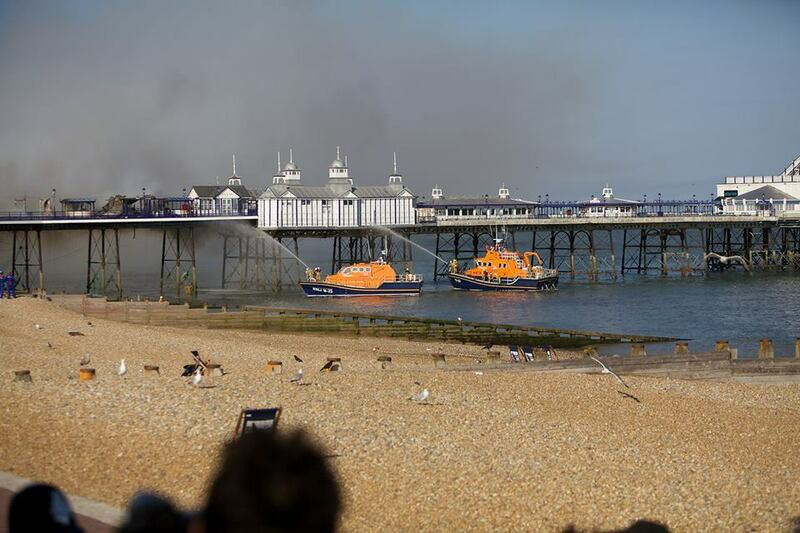 It was around 5 pm when we received the call about the Eastbourne pier fire so the pier fire had been subdued since it began at around 3pm on the 30th of july 2014. The kit that i packed was a Canon 5D with Manfrotto tripod and 70-200 f2.8 zoom lens with IS. When I arrived the smoke coming from the fire was still quite intense. Parking by the Wish Tower in Eastbourne gave me a prime view of the Eastbourne pier fire but I needed to get closer shots. Walking further up towards the pier fire and climbing up a bank to I could shoot over peoples heads got me in closer to the action. Some of the footage had to be shot with the tripod acting as a monopod due to lack of setup time and very uneven ground. When shooting on 200m zoom this can be very difficult. Once home the footage was loaded as Pro-Res 422 into FCP X and the brief was to have shots longer than 4 seconds and they had to be static with no zooms or pans and the whole sequence wasn’t to be longer than 2 minutes. The good thing about FCP X is that its fast and time was of the essence. Once the footage was edited its was converted to H.264 format ( file size was around 180mb) and we uploaded it to wetransfer.com the upload details where provided by the Company in Germany. The finished footage of the Eastbourne pier fire can be viewed at RUPTLY TV. Please find a link here to our Video camera crew UK service.